Chicago law firm partners, Keith Hebeisen and Brad Cosgrove were recently recognized for their Medical Malpractice verdicts by the National Law Journal and Law Bulletin Publishing Co.
Keith Hebeisen (left), partner at Clifford Law Offices, accepts a Trial Lawyer Excellence Award from John Kirkton of the Jury Verdict Reporter in Chicago. Hebeisen received an individual award for Trial Lawyer Excellence that was presented by the Jury Verdict Reporter, a division of Law Bulletin Publishing Co.
Bradley Cosgove, partner at Clifford Law Offices, obtained the #1 verdict in Illinois in 2014, according to the National Law Journal. The National Law Journal also announced that it was the 40th top verdict in the country this year. 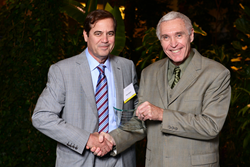 Keith Hebeisen, a partner at the firm and head of the medical malpractice team, also was recognized. Hebeisen received an individual award for Trial Lawyer Excellence that was presented by the Jury Verdict Reporter, a division of Law Bulletin Publishing Co.
John Kirkton of the Jury Verdict Reporter presented the award to Hebeisen that was inscribed “In Recognition of Successful Representation of Your Clients. The annual event was held in October in Chicago. Top Ranking Chicago Law FirmClifford Law Offices is ranked one of the top Chicago law firms, serving clients nationally and internationally with 21 personal injury attorneys. Our personal injury law firm concentrates in complex personal injury litigation such as for wrongful death.